Smoktech V8 baby Q2 replacement coils,resistance is 0.4ohm, can work at 40w to 80w,best work at 55w to 65w.brings you deep and rich cloud taste. 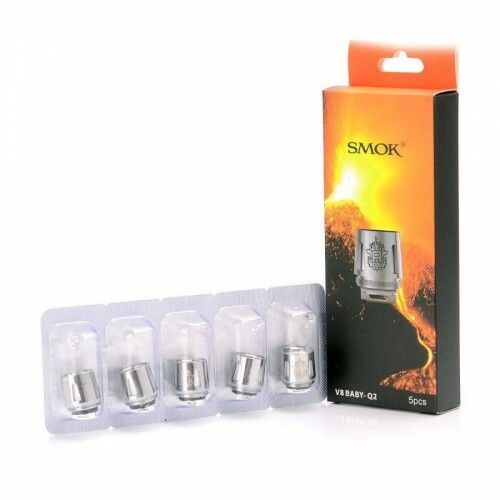 this is dual coils,5pcs per pack. smok tfv8 baby beast coils only can work on tfv8 mini tank only. T3 COILS:Smoktech TFV4 Tank Replacement Sub Ohm Coils. 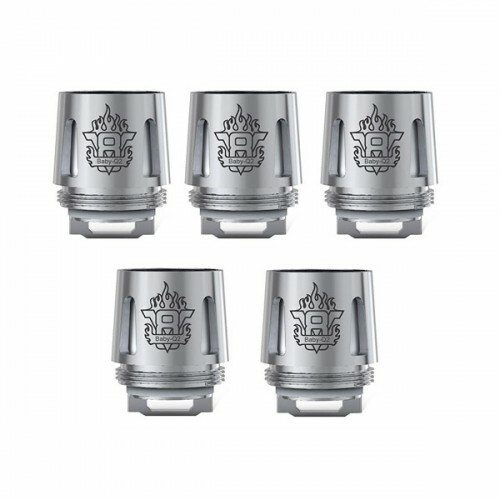 DESCRIPTION:Patented Triple Coil Headhig..
T4 COILS: These patented coils feature four vertically stacked coils for the ultimate vaping e..
SMOK TFV8 BABY T8 OCTUPLE REPLACEMENT COILS:The Smok TFV8 Baby T8 Coils 5 pack are the little baby..
V12 - T12 COILThe Authentic SMOKTech SMOK V12-T12 Coil Heads are for TFV12 Tank in 0.12 ohm resist..
SMOK TF - CLP2:The TFV4 Series TF-CLP2 Clapton Coil Head is intended for use with the TFV..
SMOK TF-T3 0.2OHM TRIPLE REPLACEMENT COILS: The SMOK TF-T3 0.2ohm Triple Replacement Coils (5 ..
V8 BABY-X4 COIL:The V8 Baby-X4 coil head is suitable for SMOK TFV8 Baby Beast tank atomizer / TV8 B..
SMOK STICK V8 KIT:SMOK Stick V8 Kit, the newest pen style starter kit from SMOK, which brings the ..